Influencing the Dynamics roadmap really works… From idea to Fall release! I love how, for a while now, the Dynamics product teams are open for customer and partner feedback via the ideas.dynamics.com community. In it’s early days, I believe product team adaption of, and visibility on, the platform was low, but this has definitely changed over time. In my experience, posted product ideas generally get looked at by the product teams and commented or on or assigned a status, such as ‘Planned short term’, ‘Planned mid term’ or ‘Planned long term’. Still, there is much work to do to further improve the platform. Further increased product team activity and visibility is very welcome, as still a lot of ideas seem to be stuck in the ‘New’ state and ideas already implemented, maybe even as a result of the idea, are not marked as such. Secondly, it would help if the search functionality would be improved. That would allow for better searches on existing ideas and these would collect more votes, instead of users tending to generate new ideas after an unsuccessful search. That said, I’m very happy with the platform and the potential it has. Ideas are truly welcomed and can lead to new or improved functionality in the product in a relative short time. To provide with an example, I’ve posted an idea regarding the vendor collaboration portal functionality. At that point, the vendor portal allowed for purchase order confirmation, invoicing and consignment inventory. However, it lacked a way for the vendor to view and/or manage it’s ‘own’ information as it resides in the customers’ Dynamics environment. You can guess, my idea was to extend the vendor portal allow for a way for the vendor’s contacts to manage the companies master data. The idea was not largely voted on, but did receive a comment from on of the product managers. And it got tagged as ‘Planned Short term’, great! Vendor collaboration has been extended to enable vendors to view and selectively maintain their own company information, such as contact information, business identification data, procurement categories, and certifications. The vendor can view and respond to RFQs, which includes the ability to receive and upload attachments. The collaborative interface allows the vendor to receive information about the awarded or lost bids. In public sector configurations, RFQs can now be published and exported as entities via data management. This enables the data to be consumed and exposed in a customer-hosted public website. 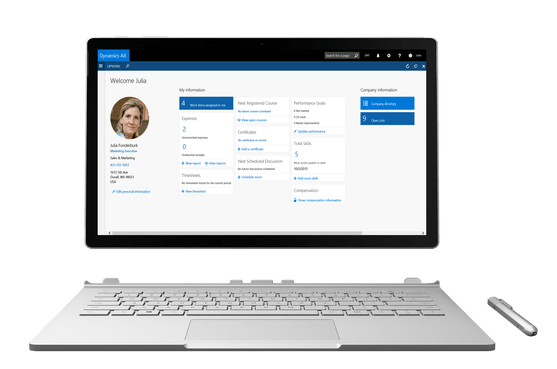 A new workflow-supported process, Vendor onboarding, can facilitate the addition of new vendors to Dynamics 365 for Financial and Operations. The vendor is invited to register based on a signup request imported via entities or based on a request entered directly in Financial and Operations. The registration process provisions the person representing the vendor with a user account that has restrictive security roles and then invites the user to register by completing a wizard-guided process. The guided registration process prompts for data ,such as contact information, business identification data, procurement categories, and questionnaire answers. The information entered by the vendor contact person is populated in a vendor request and after the information has been approved via a workflow process, a new vendor account is created. When provisioning the vendor collaboration user, you must activate the vendor collaboration functionality one of more legal entities, and you must assign at least one user role. The process to activate a vendor collaboration user includes a request process flow that is using workflow functionality. To complete the activation, you must approve the workflow task(s) created. Mind you, the standard Contoso workflow consists of multiple approval steps. After the workflow process is complete, the activation process is approved as you can see on the vendor collaboration user request. The vendor collaboration user account is now activated. Let’s navigate to the Vendor Collaboration module. The Vendor Collaboration module includes multiple workspaces, including the Vendor information workspace. This workspace shows vendor information and information on the vendors’ contacts. From the Vendor information summary, the user can navigate to more details. Under more details, there are pages for addresses, contact information, business parameters, and more. From these pages the master data can be changed.